Generations of farmers follow his footsteps. Cover crops (also known as green manures) are plants primarily grown for the benefit of the soil rather than for crop yield. With autumn only a few months away, now's a good time to think about planting cool-season cover crop seed mixes for your farm or garden. 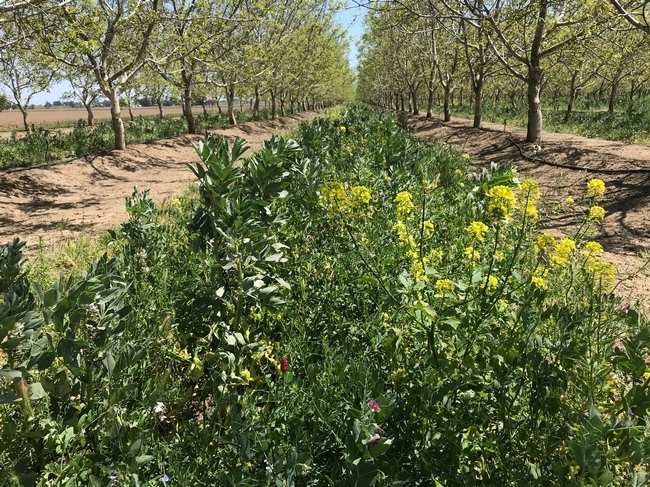 Cover crop in a walnut orchard, with flowers to attract beneficial insects, Yolo County, 2018. 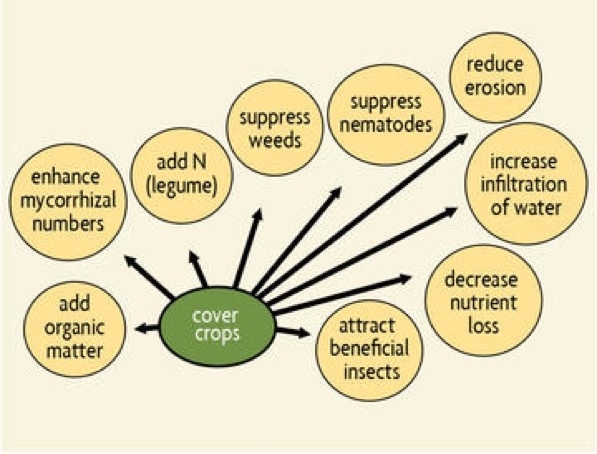 The benefits of cover cropping include reduced soil erosion, adding organic matter, nutrients, and mycorrhizae to the soil, and weed and nematode suppression. Cover crops also increase nutrient retention and water infiltration. And some, such as radish, break into compacted soil layers, making it easier for the following crop's roots to develop more fully. Flowering cover crops on farms also increase beneficial insects, including bees and natural enemies, that provide pollination and pest control services in crop production. 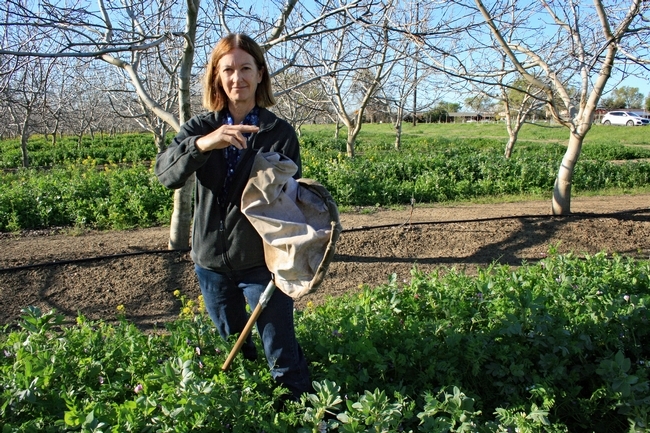 How do cover crops benefit natural enemies? Beneficial insects need nectar and pollen to survive and reproduce. For example, adult parasitoid wasps feed on flowers, while the parasitoid larvae prey on pests such as aphids, caterpillars, and stink bugs. Lady beetle, aka ladybugs, feed on flowers, especially during times of prey scarcity. In addition to flowers, cover crops, such as vetch and bell (fava) beans, have extra-floral nectaries or spurs at the base of the leaves. These secrete a sugary syrup that attracts beneficial insects, such as syrphid flies to control aphids. Insectary cover crop seed mixes. Winter mixes that attract beneficial insects (aka Insectary Plants) and fix nitrogen include bell beans, clovers, field peas, and vetch. Other insectary plants to add to a cover crop mix include forbs such as baby blue eyes, poppies, phacelia, purple Chinese houses, sweet alyssum, and tidy tips. Small grains (triticale, barley, and rye) are good pollen sources for beneficial insects. It's a good idea to order insectary cover crop mixes from local sources to avoid potential introduction of non-native forb-type plants from other areas. Cover crops to perhaps avoid in some crop rotations. Avoid cover crop species that host arthropod pests or plant pathogens that can damage nearby crops. For example, bell beans are a key host for tomato spotted wilt virus vectored by thrips insects, UC IPM. Mustards attract beneficial insects, but are significant hosts for pests such as stink bugs, cucumber beetles, flea beetles, and lygus bugs. Alfalfa has extra-floral nectaries, but is not a recommended insectary plant because it hosts pathogens, including alfalfa mosaic virus that infects a number of crops, including tomatoes (UC IPM). How important are floral resources for natural enemies? In a 1998 research article, Beneficial insects move from flowering plants to nearby crops, published in California Agriculture journal, I pointed out that beneficial insects extensively use flowering cover crops. In a mark-and-recapture study in an almond orchard with a cover crop, 80 percent of the syrphid flies and 40 percent of the lacewings (both aphid feeders) trapped in the trees fed on flowers and extra-floral resources that the insectary plants provided, as did 10 percent of the parasitoid wasps, which prey on peach twig borer. 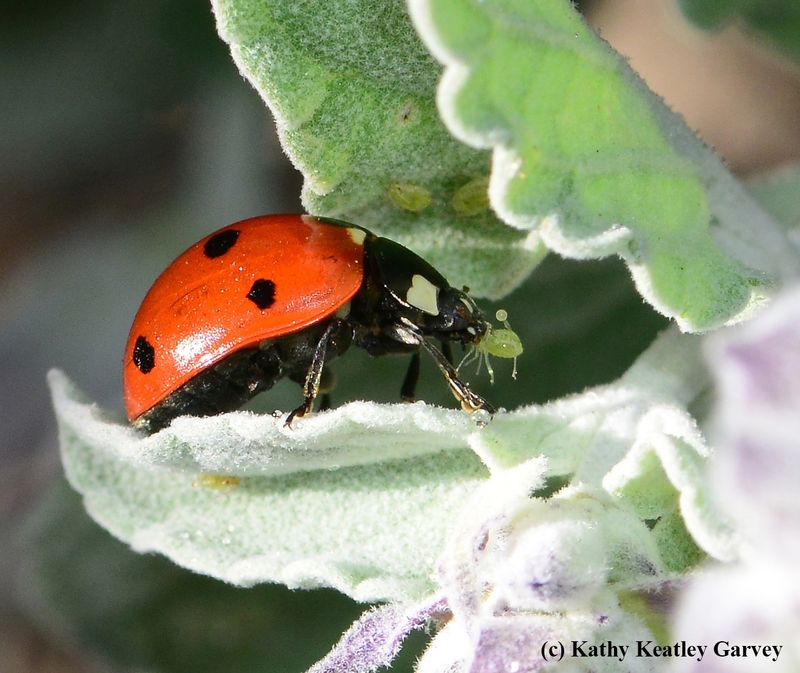 Ladybugs primarily feed on aphids, but they will also feed on floral resources during times of prey scarcity. Balancing multiple needs of cover crops. Note that legumes need to be mowed or disked prior to full bloom for maximum nitrogen fixation, limiting floral resources. To favor beneficial insects, don't mow or disk all of your cover crop at once; instead, leave occasional strips of flowering plants on your farm. Beneficial insects will find the flowers, as they move around (at least 600 feet for many natural enemies and over a mile for bees). If frost is a concern in your orchard, consider planting strips of low-growing insectary plants, such as tidy tips and other forbs listed above. Be sure to select seed mixes that work with surrounding crops. George Washington used cover crops to replenish the soil; they're also good for the soul when you savor the benefits, especially all the flowers and beneficial insects attracted to them. Why not play a game of “I Spy” in your cover crop and see if you can find a bumble bee or one of the myriad of natural enemies featured in the UC IPM poster, Meet the Beneficials. Flowering cover crops support wild bees and a regional sustainability agenda, part of the June 2018 research update in California Agriculture journal. I loved when you mentioned how cover cropping can help you reduce erosion. It is important to understand how this method works in order to get the best way to maintain your soil. A friend of mine was talking about how he wanted to do some erosion control, so I wanted to help him look for options.